Bongs and water-cooled pipes (shishas), typically made from ceramic, glass, acrylic or bamboo, cool the smoke allowing larger hits to be taken. The water also washes out some of the particulates and tars produced in the smoke for a healthier, smoother toke. A bowl holds the smoking mix and sucking on the stem draws the smoke down through the water reservoir. A small hole or “choke” is kept covered during drawing of the smoke and uncovered for inhalation. Interesting Stoner Fact #503: the word bong is derived from the Thai word for ‘bamboo pipe’, and bongs have traditionally been used by the Hmong tribes of Thailand and Laos, as well as in Africa, before their use (and the name) caught on in the West during the 1970s. Thank you, hippies! A nice bong is a necessity for almost any smoker. If you're looking to add a new water pipe to your collection, whether it's a novelty item or a simplistic glass piece, we guarantee to have something for you. 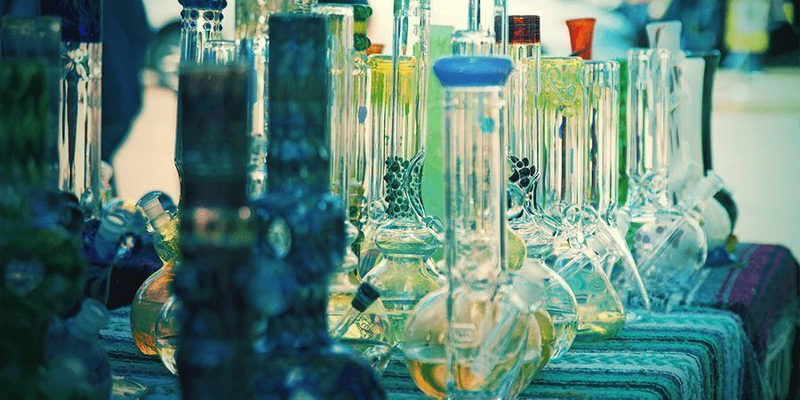 Our Head Shop stocks hundreds of bongs in a wide variety of materials, including glass, acrylic, ceramic, metal, and much more. We also stock high-quality novelty bongs, and a variety of accessories and spare parts. We are strongly committed to providing our customers with the best materials to enhance their smoking experience. Hence, we only stock quality products from the best manufacturers in the industry. If you're ready to start browsing our products, use the subcategories above to find what you're looking for. Alternatively, keep reading for more information about bongs, their history, and much more. Bongs have been around for centuries. In 2013, archaeologists excavated a kurgan (an ancient type of burial mound) in Russia created by the Scythians, a fierce group of nomads who inhabited large parts of the central Eurasian steppes between the 9th and 1st century BC. The excavations unearthed 2400-year-old pure gold bongs used by Scythian tribal chiefs to smoke cannabis and opium. Bongs were also used in Persia, along the Silk Road, and in China during the 16th century to smoke tobacco, and were even popular among royalty, such as Chinese Empress Dowager Cixi, who was even buried with at least three water pipes. In many parts of Asia, such as Vietnam and Thailand, people still use bamboo bongs to smoke tobacco today. The bongs you’ll find on our site can be complex, complete with various size chambers and a bunch of accessories such as different size bowls, attachments designed to be used with oils and other concentrates, and much more. While all of these accessories have a different effect on the overall smoking experience you get from your bong, all water pipes essentially work the same way, using a bowl, stem, and water chamber to produce smoke. After the bowl has been packed with a smokeable substance and water has been added to the bong’s main chamber, the substance is lit and smoke is drawn down the stem, filtered through the water and drawn out of the mouthpiece. There are plenty of reasons why some smokers prefer to use a bong over dry pipes, cigarettes, joints, or blunts. Some simply prefer the process, while others claim that bongs produce a smoother smoke. This may be true, seeing as the water may help to cool the smoke before it enters the smoker’s lungs. Many smokers claim that the water is able to filter more harmful chemicals than other filters. This may be true when smoking cannabis, as joints and blunts are often smoked without a filter. However, studies comparing tobacco smoke from cigarettes and water pipes have shown that both forms of smoking can have negative effects. Despite the fact that water pipes have existed for thousands of years (as noted above), there is a significant lack of research comparing this form of smoking with others. Smokers who have never experimented with a bong might feel a bit intimidated the first time they lay their eyes/hands on one. However, the process is actually quite simple. 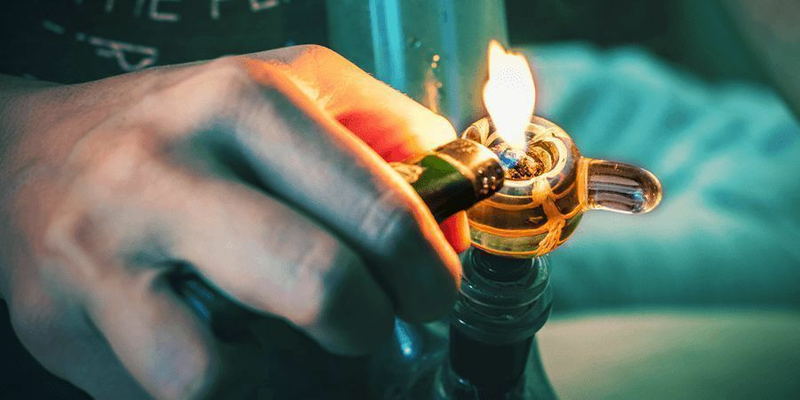 Here are the basic steps on how to smoke a bong. Make sure you clean your bong before each use. Fill your bong with water via the mouthpiece until the stem is covered by roughly 0.5-1 inches of water. Avoid overfilling your bong as it may splash in your face and cause a mess. Add ice to the water for a smoother smoke. Pack the bowl with your preferred smoking substance. Make sure the bowl is packed tightly to just under the brim and that your substance is not chopped too finely as it may get sucked through the bowl and down the stem. Also, avoid clogging your bowl by overpacking it. Place your mouth on top of the chamber, making sure to have your lips inside the mouthpiece. Slightly press your face against the mouthpiece to stop any of the smoke from escaping. Light your substance and draw in air through your mouth simultaneously. The water should bubble and the chamber should start to fill with smoke. Once the substance is bright red (or “cherried”) remove the flame to avoid charring it. Keep drawing in air until the chamber is filled with the desired amount of smoke. When you’re ready to inhale, remove the stem from the bong and draw the remaining smoke into your lungs. Hold the smoke in your lungs for a few seconds and exhale. NOTE: Some bongs have a “carb hole” instead of a removable stem. This is a small hole either beside the stem or at the back of the chamber. As you light your substance and start to draw smoke into the chamber, be sure to block that hole with your finger to stop any smoke from escaping. Once you’re ready to inhale the smoke within the chamber, remove your finger from the carb. Nothing ruins a good smoke like a dirty bong. Below are some simple instructions to help you keep your water pipes nice and clean. Dismantle the bong. This will allow you to wash each piece individually. Rinse each individual piece of your bong with hot water and let them dry. Start by cleaning the main chamber. Fill a bucket with a simple cleaning solution (such as a mix of vinegar and baking soda), place the chamber inside and gently scrub it with a sponge or cloth that won’t scratch the material. Rinse the chamber and repeat if necessary. Repeat step 3 for each piece of your bong. To clean any small areas of the bong, such as the stem, the bowl, and any extra chambers, we suggest using the Black Leaf Pipe Cleaners available through our store. Once you’re finished, make sure you rinse all pieces of the bong with hot water to remove any of the cleaning solution. Then set the pieces aside to dry completely before reassembling your bong. NOTE: For best results when cleaning your bong, we suggest using the Bong Master Cleaner solution available through our store. Simply mix 1-2 tablespoons inside your chamber with hot water, wait 5 minutes, rinse and you’re done. The bongs in our store are divided into 4 categories; glass, acrylic, ceramic, and novelty bongs.